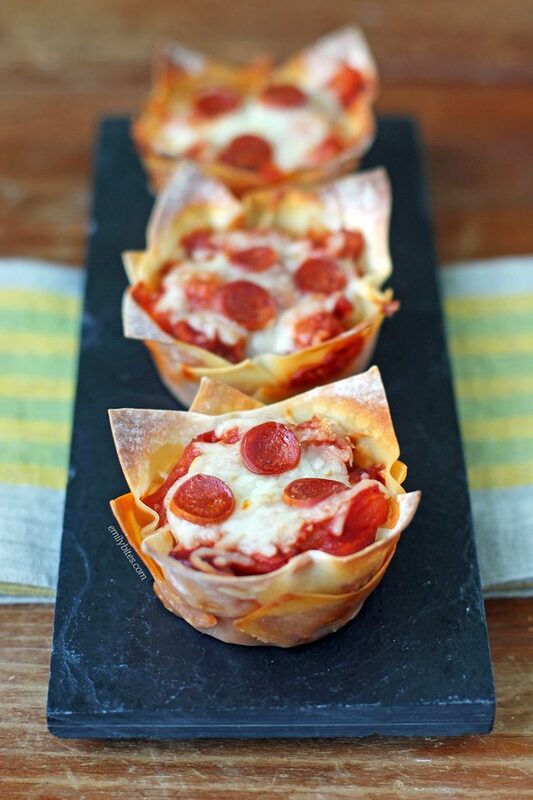 I can’t believe it has taken me so long to bring you a recipe for Pizza Wonton Cups, but I promise these are worth the wait! 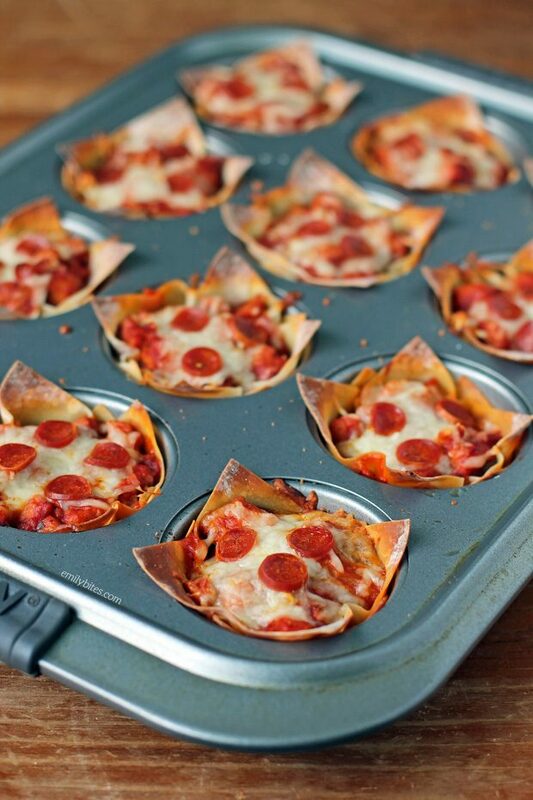 Over the years I’ve made a ton of savory wonton cupcake varieties, and these pizza ones are truly one of my favorites. With spicy sausage and pepperoni, along with customizable fruit or vegetable topping of your choice, I think you’ll find these are full of flavor. Mr. Bites and I love sweet pineapple with spicy pizza flavors, so we use pineapple in this recipe, but I know that’s a controversial pizza topping so feel free to use mushrooms, peppers, or whatever topping you prefer. I really do urge you to try pineapple in these sometime though, because the sweet and spicy combo is everything. Each of these Pizza Wonton Cups is just 135 calories or 3 Weight Watchers SmartPoints, so you can easily decide the perfect portion for you. They’re family friendly and the leftovers are perfect for lunches. You could even make these as finger foods for a party, book club or sporting event! Looking for more ways to use wonton wrappers? I’ve got you covered! Check out my recipes for Chicken Parmesan Wonton Cupcakes, Mini Cinnamon Apple Tarts, Taco Cupcakes, French Dip Cupcakes, Berries and Cream Cinnamon Dessert Cups, Buffalo Chicken Cupcakes, Cheeseburger Cupcakes, Lasagna Cupcakes and many more! Pre-heat the oven to 375. Lightly mist 12 cups in a standard muffin/cupcake tin with cooking spray and set aside. Place the sausage in a medium skillet and bring to medium heat. Cook, breaking up with a wooden spoon into smaller pieces, until sausage is cooked through. *If using a vegetable that needs to be cooked (mushrooms, peppers, etc)*, add those to the sausage and continue to cook for a few minutes until the vegetables are softened. If you’re using pineapple you don’t need to cook it, you can just add it in the next step. Transfer the cooked sausage and the cooked vegetables or chopped pineapple to a mixing bowl. Add most of the chopped pepperoni (reserve some to sprinkle on top), the pizza sauce and the Italian seasoning and stir together to combine. Push a wonton wrapper into the bottom of each of the sprayed cups in the muffin tin. Using about half of the sausage mixture, spoon evenly into the wonton wrappers. Sprinkle about half of the shredded mozzarella evenly over the top of each cup. Press another wonton wrapper on top and repeat the layering steps with the remaining sausage mixture and shredded mozzarella. Sprinkle the reserved pepperoni on top of the completed cups. Bake for 18-20 minutes until the wontons are golden brown and the contents are heated through. Remove the muffin tin from the oven and allow to cool for 2-3 minutes before removing from the tin. These look so good. I love how simple and fun they are. The little pepperoni are adorable! I will definitely need to make them with pineapple. I love it on pizza. So many options for the toppings on this one! 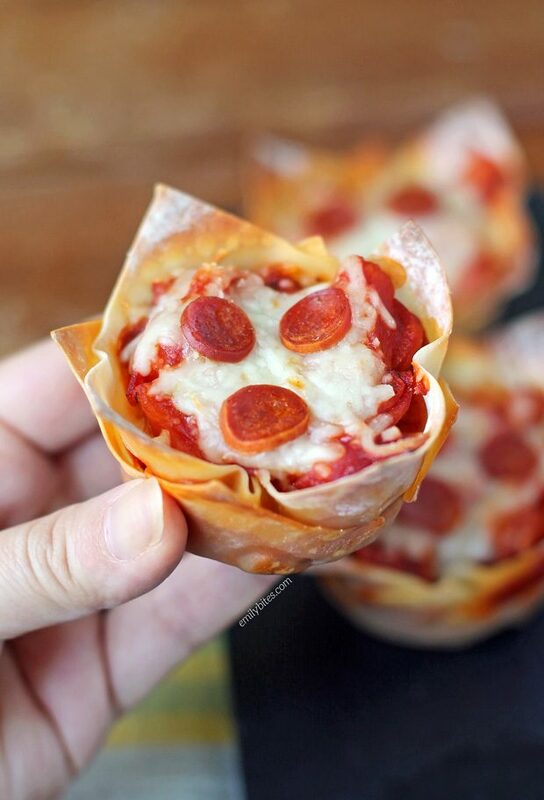 Are these pizza wonton cups freezer friendly? I don’t freeze anything so I consider myself wholly unqualified to answer questions regarding how to best freeze specific foods and recipes. I’m sorry! If you try it out please report back! I bet you could freeze the filling, and then just assemble when you wanted to make them. That would save a bunch of time. These are so delicious and so super easy! My entire family LOVED them. These do not taste like a cheap substitution for pizza…these completely satisfy the craving for pizza. Hi Kaari, the Weight Watchers recipe builder does not count the nutrition information for fruits and vegetables so it frequently has different results than running the nutrition information through the calculator. Hope that helps! My kids loved these. I want to try new flavors. Both of my kids are trying to lose weight along with me. They eat what I eat and even keep track of points! Since their doctors have given the green light for them to be on WW it is so exciting to find kid-friendly recipes like this one for them to eat. Hi Emily! We made these tonight and they’re SO GOOD!!! I love being to have pizza without the calories of the crust, and stay within my points! One question…ours were kind of soggy on the bottom. Does this ever happen for you? Any thoughts on keeping that from happening? Thanks! Hm, mine never get soggy but they aren’t really supposed to get crispy on the bottom either. i think of them kind of like pasta layers. If you do want them to be crispy on the bottom you could always bake them for a few minutes with just the first wonton layer in the cups and then add all the other ingredients/second layer and then bake again according to the recipe instructions. I think that would help get the result you’re looking for! These are awesome! Really easy to make and totally satisfy the craving for pizza. Plus, I love that you can customize them to make any kind of pizza you want.